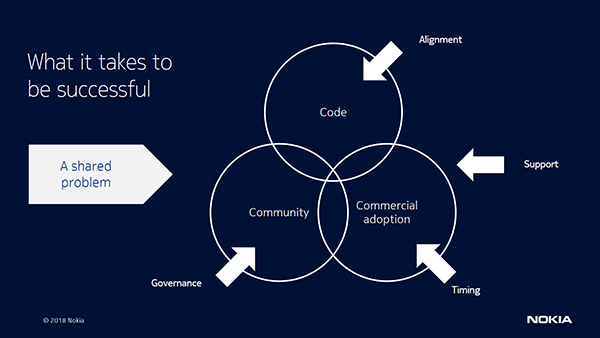 People often ask me how Nokia chooses which open source projects to take part in and what their success looks like. Open source projects cost money and resources. Nokia has started, participated in and even left multiple open source projects in the past. In every case, we take the time to consider them carefully. But how do we do that? What are our thought processes? Alignment: We view open source development as R&D that is shared with our customers, peers and other interested parties. Joint development addresses a common and shared problem – this is the pre-requisite. Timing: The timing must be right to reflect to the situation and its maturity in the industry. It’s essential there exists demand for the project. If other projects, or established commercial software already solves the issue, the chances for success will be lower. Support: There have been cases where a common problem exists and the timing to solve it would be right, but projects still fail. There needs to be a willingness for participants to actively invest in a project and thereby provide support. This means a community of participants who not only identify the problem, but also actively acknowledge they have the interest to solve it. Governance: The governance of the open source project needs to be right, something that is often overlooked. The right governance model makes participants feel welcome and their contributions will be valued. They feel they are fairly treated and have a fair way to influence the direction. This includes both the governance structure of the project and the legal setup. Both the organizational structure and contracts, like Contributor License Agreements, need to be fair. At Nokia, open source is a central part of our development activities, no different to developing commercial software as both with the same prerequisites of resourcing, investment and leadership. We have extensive experience in open source and know what it takes to get projects done, which is why we apply the strict assessment criteria I have described. Finally, I would like to draw your attention to the forthcoming open source event – the Open Networking Summit March 26th-29th, 2018 in Los Angeles. The summit will address some of the projects and technologies that are most strategically important to Nokia, such as Open Network Automation Platform (ONAP) and Open Platform for NFV (OPNFV). I hope to see many of you there.